Cover artwork: Photograph by Nigel Luckhurst. A welcome reissue of a disc capturing one of the wittier evenings at London’s Wigmore Hall. For anyone who wasn’t there on 17 June 1988, this disc is joyous discovery, where Schoenberg rubs shoulders with Cole Porter, Madeleine Dring with Gershwin, while Jeremy Nicholas’s brilliantly punning pieces prove that the traditions of Flanders & Swann are alive and well; where you can feast on oysters and cottage cheese, squashed tomato sandwiches and kippers, where bald men acquire unlikely headgear in the name of seduction, where love is pursued, gained, lost or (worse) simply becomes dull and where fairies do indeed live at the bottom of the garden. 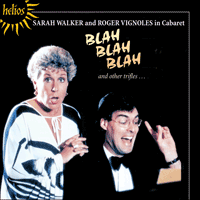 A delicious concoction, performed with piquancy and tenderness by Sarah Walker and Roger Vignoles. Gershwin’s first biographer, Isaac Goldberg, referred to him in 1931 as ‘a young colossus bestriding American music, with one foot in Tin Pan Alley and the other in Carnegie Hall’. It seems appropriate, therefore, for Gershwin to open this album of songs, recorded at a public concert in June 1988 in the hardly less august surroundings of the Wigmore Hall in London and including not only music by his contemporaries Cole Porter and Jerome Kern, but also songs by a very different colossus of twentieth-century music—Arnold Schoenberg. As it happens, when Gershwin moved to Hollywood in 1936, Schoenberg was a near neighbour, and the two composers became friends through a mutual love of tennis. As a young man, Schoenberg had had, if not a foot, at least a big toe in the world of popular Viennese music—he made arrangements of Strauss waltzes for chamber orchestra—and his seven Brettl-Lieder, or Cabaret Songs, stem from an association with the literary cabaret of Berlin in the early 1900s. Yet another musical genius with a foot firmly in both musical camps is Leonard Bernstein. He is represented here by Who am I?, a song of rather striking metaphysical speculation from Peter Pan (the words are Bernstein’s own). Incidentally, the show ran for 320 performances on Broadway with, of all people, Boris Karloff in the part of Captain Hook. Gershwin’s first film score after arriving in Hollywood was the Astaire-Rogers Shall we Dance? Among the hits was They all laughed—a song that still packs a punch, even though some of its topical references have now faded into obscurity. (Who is Whitney with his cotton gin—or Fulton and his steam­boat?) The lyrics, as for the other three Gershwin songs, are by George’s brother Ira, who reaches the heights of verbal panache in Boy, what love has done to me!. Avoiding social disaster is clearly uppermost in the mind of Jeremy Nicholas’s dinner party hostess in Place Settings, a song that is also striking for the strain it imposes on the singer’s memory. Both this and Usherette’s Blues are among the hundred and fifty-odd songs Nicholas has written for the BBC’s Radio 4 programme ‘Stop the Week’, every one of them an astonishing example of speed-writing, written and composed from scratch between Thursday evening and Friday lunch-time. Completing a kind of gastronomic trilogy, Lime jello marshmallow cottage cheese surprise is another memory-bending patter song, written by the American composer William Bolcom for his wife, the singer Joan Morris. Bolcom himself is the composer of a fine set of Cabaret songs, explicitly conceived on the models of Britten and Schoenberg. Of Schoenberg’s seven Cabaret Songs, three are performed here, in English translations by Michael Irwin who wittily preserves both the vein of sexual innuendo in Gigerlette and The Satisfied Lover and the rampant high spirits of Schickaneder’s Aria from ‘The Mirror of Arcady’. This last represents one of music’s more happy surprises, combining as it does ‘the father of modern music’ with the librettist of Mozart’s Magic Flute in a piece of extremely un-Masonic vaudeville. No surprise of course attaches to the coupling of the names of Michael Flanders and Donald Swann, whose punningly entitled A word on my ear is one of the best ever written on a frequently attempted subject. Inevitably a high point in the proceedings, it was followed at the Wigmore Hall by a more reflective group entitled ‘Children’s Corner’. This contrasts the speculations of Bernstein’s child of the ’50s with the wide-eyed Edwardian whimsy of Liza Lehmann’s There are fairies at the bottom of our garden, of which it is likely that more people know the title than have ever heard the song. Geoffrey Wright’s Transatlantic Lullaby represents the generation in between. A song of immediate appeal, it was written in 1936 for a Gate Theatre musical on that most English of subjects, an English prep school; the matron is an American floozie who sings her charges to sleep with her Transatlantic Lullaby. Both the soft-shoe shuffle of the refrain and the haunting parallel triads that accompany the singer’s opening lines unerringly conjure up the sleeping city. The songs in this programme have come our way via a variety of sources, and we are indebted to Richard Rodney Bennett, whom we first heard play and sing it himself, for introducing us to Sheldon Harnick’s mounting catalogue of Interfloral disaster, Someone is sending me flowers. Cole Porter’s Where, oh where?, which follows, wittily combines a romantic manner with a reminder of the time when a fur coat and a private swimming pool were among the faster routes to a girl’s heart. No doubt such dreams also occupied the youth of John Betjeman’s Song of a nightclub proprietress. If so, it is not the only link between the two songs; the arrangement of Where, oh where? is by Madeleine Dring, whose setting of the Betjeman poem captures precisely its seedy disillusionment. Jeremy Nicholas’s Usherette’s Blues is another character piece in which a simple idea yields a little gem of quite unexpected resonance. The final song in the album, Bill, is an encore—a gentle tribute to William Lyne who as manager of the Wigmore Hall made it into one of the finest recital venues in the world. None other than P G Wodehouse had a hand in the lyrics—yet another example of the extraordinary array of talents that have contributed to the history of American popular music.